OK, I lie ever so slightly, the new Examples application is the old examples application but with a slightly enhanced user interface but it certainly feels new. I have now converted a few applications from OpenInsight 9.x to OpenInsight version 10 and I’m always pleased with the results. It started with me cutting my teeth on the EXAMPLES application and then I moved on to my larger RevSoft UK Contact Manager. The later benefited from a couple of weeks of evenings working on the user interface before I deleted the old 9.4.2 version and moved 100% OI10. So, a few people have asked me to produce a video of the conversion process and I’m pleased to announce that both that video and a look at an early version of the new examples application is now online and copied below. Please note that this is a relatively new YouTube Channel. I decided to drop the old one with the old 9.x videos in order to provide a clean break between the two and avoid confusion. For this reason, please subscribe to the new YouTube channel for periodic updates as I produce more OI10 videos. The February 14, 2017 issue of Database Trends and Applications features an article written by Stephanie Simone titled ITMS Uses Revelation Software to Stay Ahead of the Curve. “There are a series of features that are coming in the next release with OpenInsight 10 that we believe we will be able to use in continuing to deliver successful business outcomes to our customers,” Bolton said. Following the equal sign, you can specify the process you want to run, along with the application, user name, and password where the process should be run (comma-delimited). Multiple processes my be specified, separated by semi-colons. You can find out more about this useful OpenInsight feature in the OpenInsight Knowledgebase or by simply clicking here. Revelation have made some good progress with the OpenInsight 10 Alpha and I’m currently working through my bug list and closing a nice number of reported issues from earlier alphas, something that I’ll continue with over the weekend. In line with their open and transparent policy for OpenInsight 10, they Alpha v7 is now available for download to all Works Members. The Alpha v7 is available as a full install. So, if you have worked with earlier alpha’s please use the AppBackup facility to backup your old alpha work and restore it into the new alpha. This is what I do but one word of warning. If you keep your data, images and other supporting files in a specific folder (I keep things in C:\RevSoft10.6\MDPmyApp) you’ll need to copy that folder from the earlier alpha and into the new alpha once installed. The app restore will then use the new folder and the restore should run just fine. This version includes many enhancements to the IDE, Form Designer, Table Builder and O4W, so it is well worth a look and to take the opportunity to report any issues that you find to Revelation and have those issue addressed before Revelation releases the beta. OpenInsight for Web (O4W) v2.0, included in the OpenInsight 10 Alpha v7, is a rapid application development tool that lets you generate responsive forms, reports, and dashboards. Use the powerful GUI drag-and-drop to lay out your forms and then test in both desktop and mobile browser mode. Or use the toolset’s full-function API to create the most sophisticated web pages. Alpha v7 is set to expire on April 4, 2017. 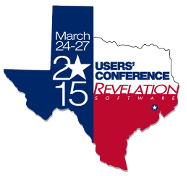 Will you be at RevCon 2015? Personally, I can’t wait for this year’s Revelation World Conference. The format will be slightly different because only those people working on OpenInsight 10 will be talking and there will be an opportunity for all of the attendees to watch all of the main OpenInsight 10 sessions as they will be repeated. There are only three general technical sessions on the Friday that will not be repeated – at least looking at the online schedule. This is great news for me because I always struggle to decide between two compelling sessions and I won’t have those dilemmas this year. Along with the informative technical sessions, Mike will be opening and closing the conference with the usual addresses and our Keynote Speaker will be Dan Lier. There will also be an opportunity to ask questions and show what you have been doing with OI during an informal evening session, a BBQ by the pool and it’ll all kick off with a Welcome Reception on the Tuesday evening. Those of you that saw the January Revelation newsletter will know that the Early Bird Discount rate was extended until the 30th January owing to publication issues surrounding the printing of the hard copy conference brochure. Hat only leaves you with a few short days to get your place booked on the number one premium learning event in the Revelation calendar. If you are developing with OpenInsight, planning to develop with OpenInsight in the near future or a user wanting to learn more, then this is the event for you. The wealth of knowledge that is available for everyone to soak up is amazing and it will only lead to a deeper depth of product knowledge that usually leads to the ability to do more, faster and at less cost than now. If you are still undecided and tempted, please check your education and training budgets. If there is a little left, then this event is a prime candidate because of the amount that you will learn from my colleagues taking the talks. Yes, there will be some fun, yes there will be the opportunity to network and make new friends and share development experiences, but mostly it’ll all be about helping you to get a head start with OpenInsight version 10, regardless of whether you are an early adopter, someone who simply wants to get the most of the beta, or a hardened OpenInsight fanatic who’ll jump straight into the new version on release day. I’ll be tweeting and blogging my way through the conference, but it’ll be no compromise to actually being there! Tempted and want to know more – download the conference brochure here and contact Revelation through the conference website. I hope that you can make the conference. Mike’s recent visit to Australia and New Zealand has really raised the OpenInsight 10 profile and some of the amazing things that Revelation will be delivering within that new version early in 2015. He’ll be over here in London for the EMEA region’s leg of his world tour this year, so please put Tuesday 23rd September in your diary today. Mike will be at the Hilton Doubletree hotel in Ealing, London on the 23rd September to headline our next Revelation User Group (RUG) meeting. He’ll be talking about all the good things in OI 10, updating us on where the company is at that time and further plans for the future – the usual popular agenda. But, it will be OI10 that will steal the show and I’m also hoping to have Carl Pates at the RUG to talk about his work on the OI 10 presentation layer, which is seeing some huge, dramatic and quite wonderful changes. Please drop me an email to register your interest for the RevUK RUG on the 23rd September. Mike will be flying into London on the Monday and he’ll be free to visit people on the Wednesday, Thursday and Friday morning if not too far from London. I already have some meeting pencilled in, so please get in touch as quickly as possible if you wish Mike to address your development team whilst over here and to discuss business matters with your management team and your future requirements from OI. For those of you that cannot wait to learn more about the new release and the highlights of what Mike was saying whilst in Australia and New Zealand recently, please checkout the trips wrap here. Mike’s recent trip to Australia and New Zealand was a huge success and this success has been picked up by Database Trends and Application (DBTA). The key topics on the agenda were OpenInsight 10’s cloud base filing system which will support Couchbase form the off and there are plans to extend that to include MongoDB and most likely Windows Azure shortly after. Mike also spoke about OpenInsight’s new user authentication and security controls coming in version 10. The positive impact on those people that Mike spoke to was enormous. To the point, where most of the developers and users that are running 9.4 at the moment actually wanted to get their hands on OpenInsight version 10 right now, rather than waiting for the expected launch in Houston during March 2015. Please click here to view the entire DBTA article published online. The article also touches on Mike’s planned trip to the UK for the next EMEA RUG. I’ll be blogging more details about that trip early next week, so please watch the blog closely.